One of the things that is most loved about the city of Vancouver is the Stanley Park Seawall. This trail runs around the whole of the famous city park and is used by thousands each day to run, jog, bike, rollerblade and enjoy the beauty that is the this oceanside city. 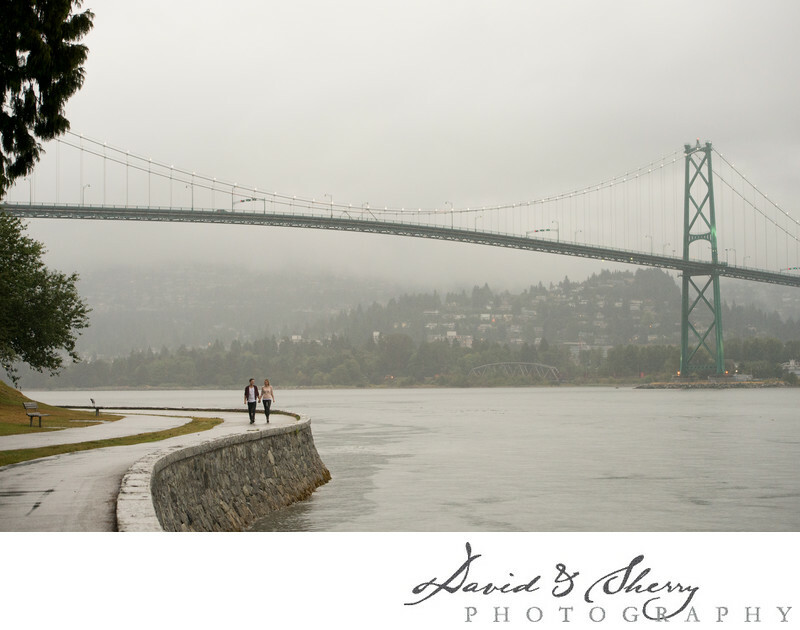 With all that there is to do at Stanley Park, our favourite is taking pre-wedding engagement photos. There are so many stunning vistas that surround this piece of property, from the view of North Vancouver, the skyline that dominates to the South and the wide open Pacific Ocean to the west. Stop at a different part along the trail and you will find another beautiful view and another interesting place to take pictures for our awesome clients who are about to be married. This photo offers a view of the Lion's Gate Bridge with the winding park trail underneath and our bride and groom walking along hand in hand. The bridge itself is a historical piece of the city, originally built by the Budweiser Company to transport goods to and from their plant to the main highway, afterwards to be given over to the care of the city. Fortunately for us, this awesome landmark helps to make beautiful landscape photos as it has done here. Location: Stanley Park, Vancouver, B.C. V6E 3E2.